Before I started using my blog as a erm, blog, I admired certain bloggers from afar. Days and nights were spent scouring these little golden nuggets of internet goodness, forever wishing I was just as freakin’ cool as them. The three blogs that always stood out to me were A Beautiful Mess, The Dainty Squid and my long time blog love Skunkboy Blog. I think I discovered all these through Etsy, which is where a majority of my internet time was spent during my time at uni, as I used to stumble across Katie’s crafting alias of Skunkboy Creatures on there a LOT. Sometimes the UK blogging community is so focussed on it’s own little bubble I forget about all the other blogs I read and was initially inspired by to start my own. 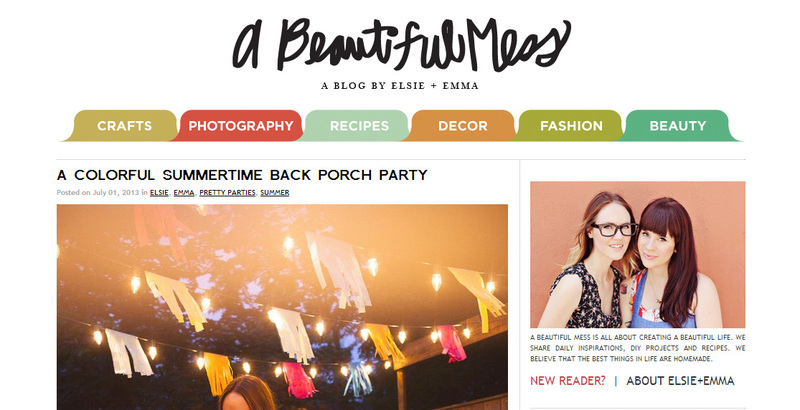 Screenshot of A Beautiful Mess Blog by Elsie and Emma. When I first started reading A Beautiful Mess it was predominately Elsie’s domain with very occasional mixes of her sister Emma, her store ‘Red Velvet’ and her marriage planning with her now husband Mr Larson…. But now the whole thing has evolved in to much more of a ‘brand’ and you’ve probably noticed on Instagram loads of people using the ‘A Beautiful Mess’ app which was recently launched. It’s super exciting to see blogs and brands evolve over time, and Elsie (who has now teamed up ‘officially with her sister Emma on the blog) maintains a great variety of crafts, fashion, lifestyle and e-courses on her own little corner of the internet. She’s literally living the American Blogging Dream, and after that collaboration with Mod Cloth I just love their style even more. 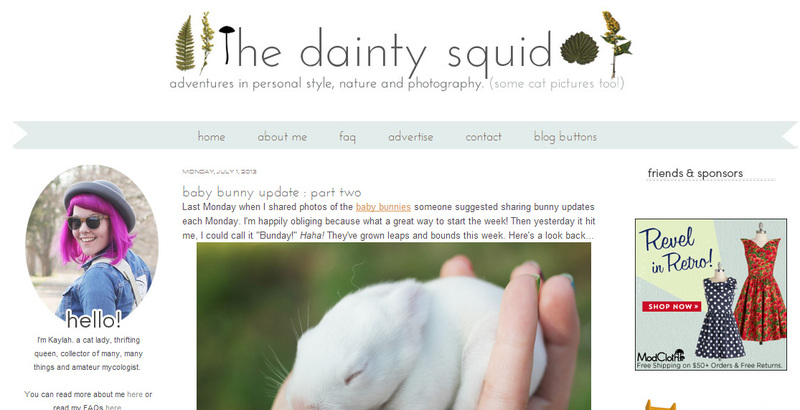 The Dainty Squid Blog written by Kaylah. Katie Shelton, oh, I’d never use the term ‘girl crush’ but if I did it would definitely be directed Katie’s way. I just want her hair, her clothes, her LIFE. She has two of the most adorable kids ever (yup, kids, I like someone’s kids, I know right?!) and Poe just looks like she’s not even real she’s so cute. Katie has that folksy style I just want my wardrobe to consist of, and her crafting skills to create her faux taxidermy goodness in her online shop is simply awesome. 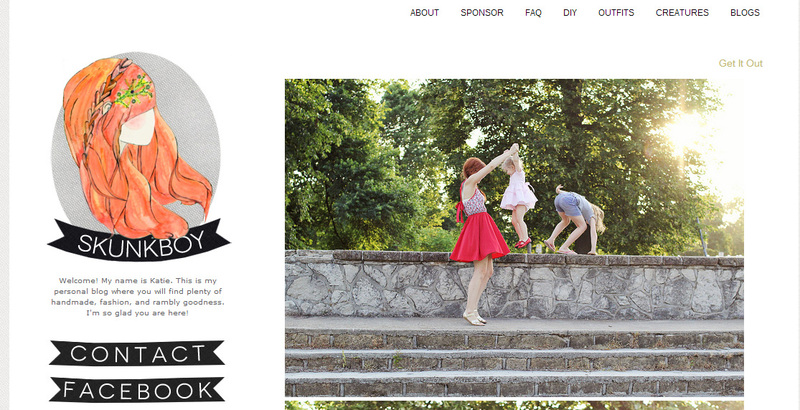 Katie is also ‘blogger of the moment’ on Mod Cloth but she’s been like, blogger of the DECADE for me. Skunkboy has also been doing a few home tours lately which are another favourite to have a nosey at. What other blogs do you read apart from the standard UK Beauty/Fashion/Lifestyle blogs? Next Post A Trio of Budget Highlighters from ELF.